They say you can’t judge a book by its cover. In a similar manner, I believe you can’t judge a home without first being IN it. This was certainly the case when I toured The Block 2018 “The Gatwick” this week. Buckle in for the surprises and my top picks as I give you a run down of my preview! The Block dominates ratings, and for good reason: Australians love to renovate. It’s a case of the chicken and the egg: did the renovation craze spur on The Block – or was it the other way around? I have an inkling the latter might be the case! 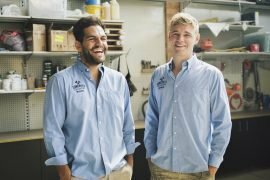 Either way, millions of Australians tune into Channel 9’s top renovation show to watch each year’s series of “The Block”. As you would know if you are a “Blockhead”, the 2018 Block is in St Kilda, inside an infamous (for all the wrong reasons) old hotel called “The Gatwick”. Five teams have gone head to head to rebuild their apartments – all for a chance to win big on auction day and be declared winners of “The Block”. We watch the competition – the tears, fights and joy – on our screens, along with each week’s room reveal. 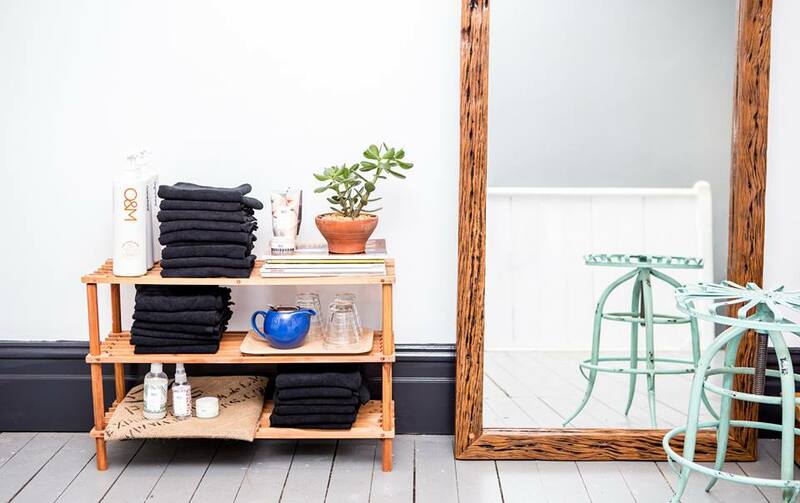 But what do these rooms and apartments actually look – and feel like – in person? 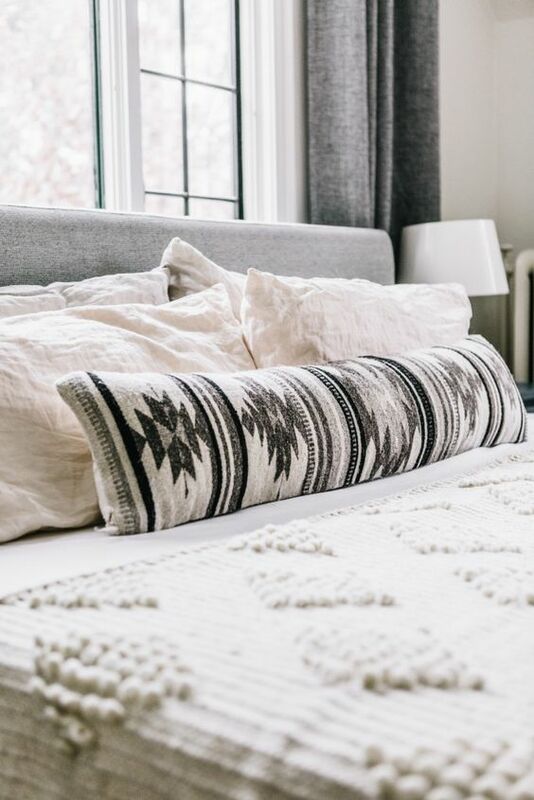 Wonder no more – I am here to share this after my tour inside 2018’s The Block! Kerrie and Spence won Kitchen Week, awarded a perfect 30/30 points for what judges praised “refined design using contemporary neutrals and a timeless layout”. 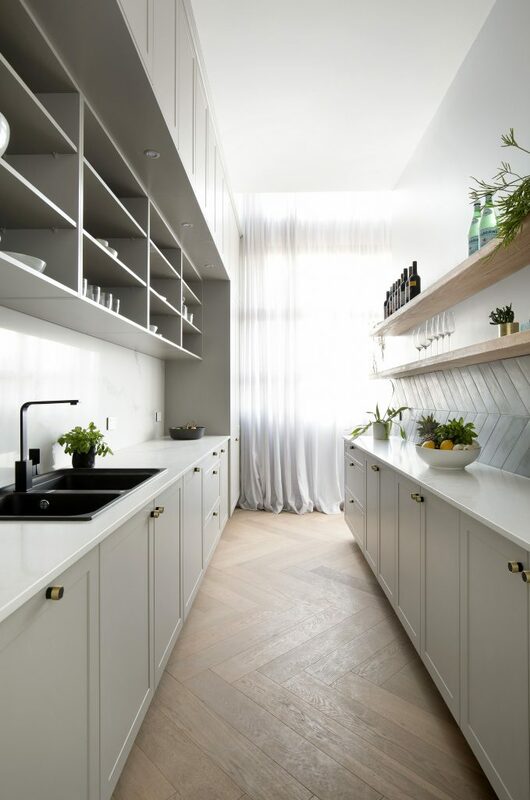 I must admit, I wasn’t sure they should have won when I saw their kitchen on TV and in images – to me, it didn’t stand out amongst the others. However, being in the kitchen really changed that. This kitchen felt good to be in. 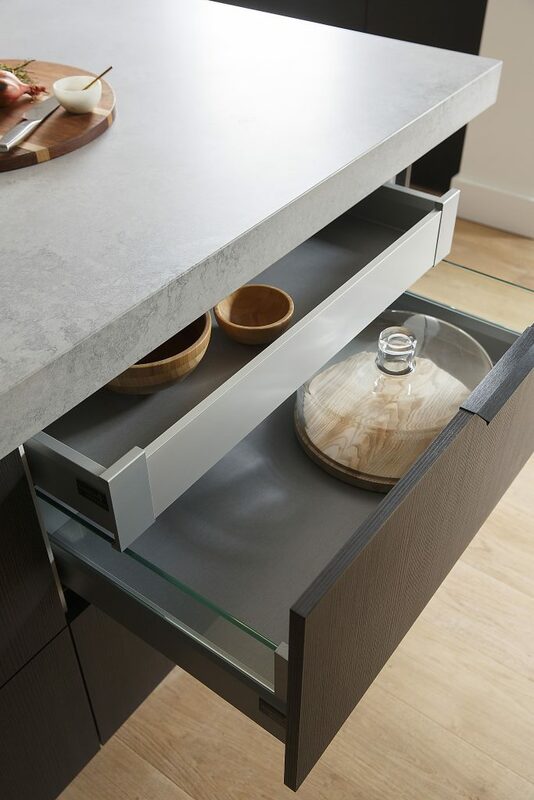 The lovely grainy “Burnished Wood” cabinetry – paired with “Moose” – by Freedom Kitchens felt sophisticated and warm. 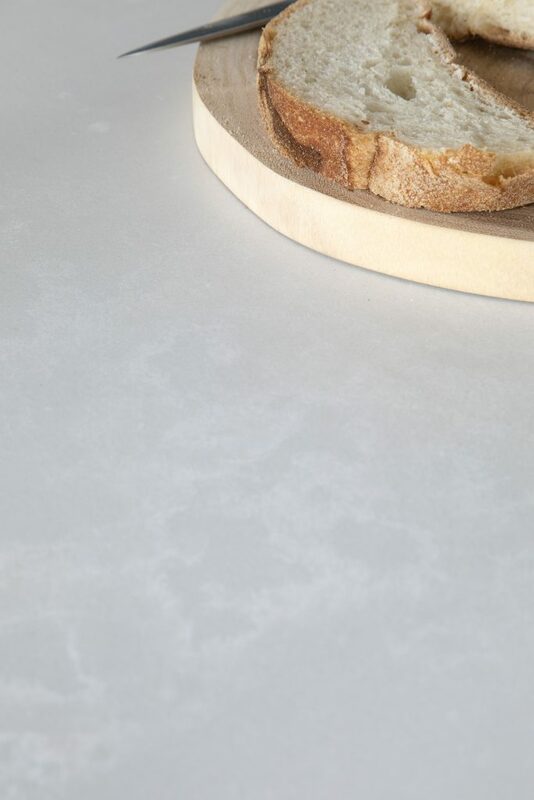 The couple paired these with Caesarstone’s Airy Concrete for the generous island bench. 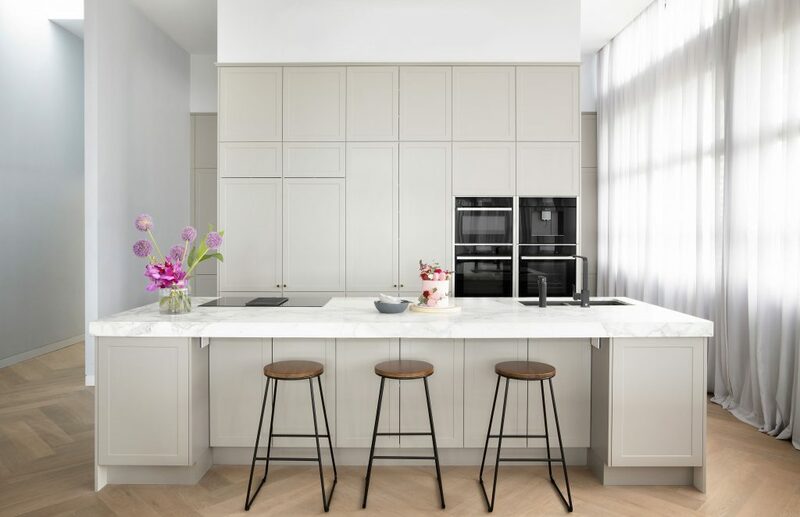 I’m a big advocate of solid, thick bench tops – and this one ticked my box! 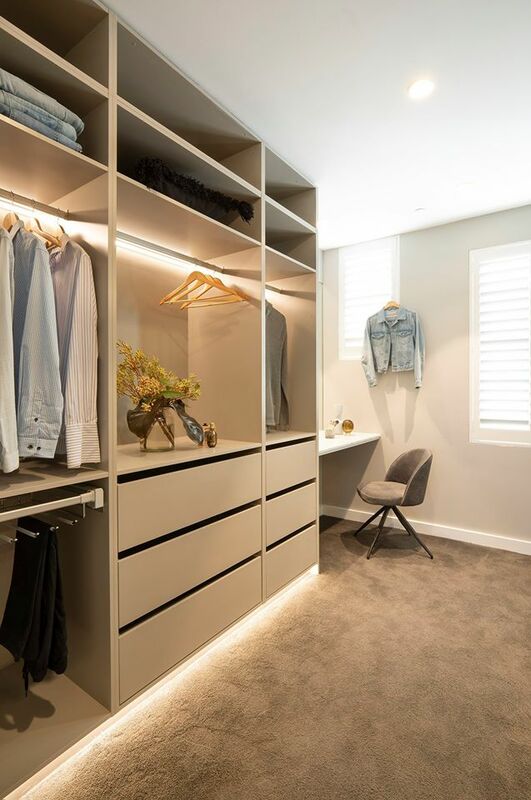 Another selling point was the double entry butler’s pantry – it really did make the space feel more open and inviting. 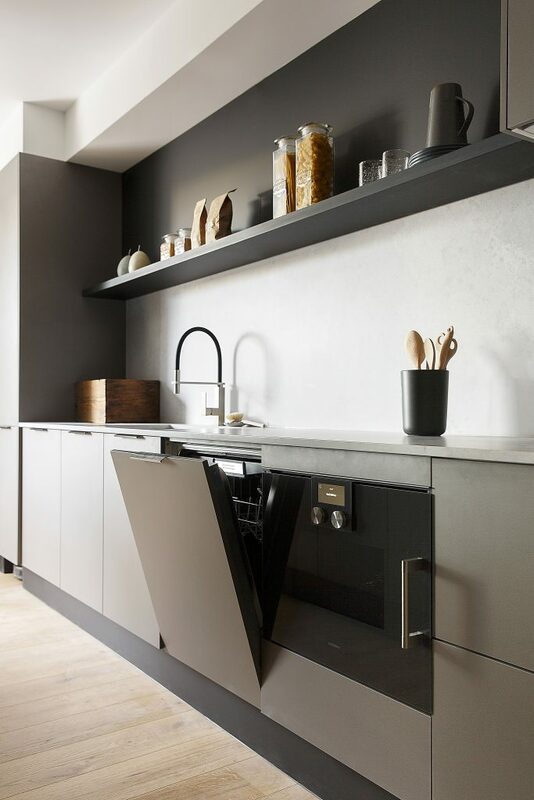 Then of course are the top of the market Gaggenau appliances: a large Sub Zero fridge, wine storage, and side-by-side ovens from Gaggenau’s 200 series, which include a 60cm oven, a combi steam oven, a combi microwave oven, warming drawer, vacuuming drawer and fully automatic espresso machine. 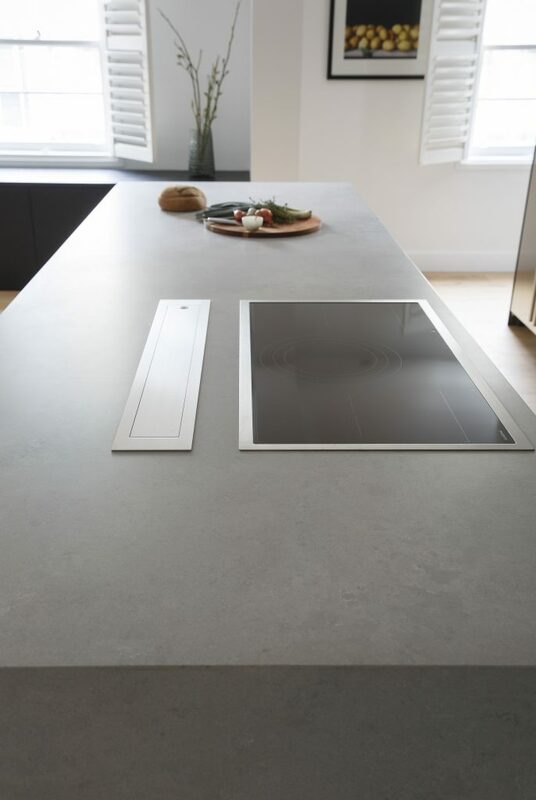 Then there’s the hero piece: the Gaggenau flex induction cooktop with the telescopic table ventilation that rises from the benchtop when needed – very clever! 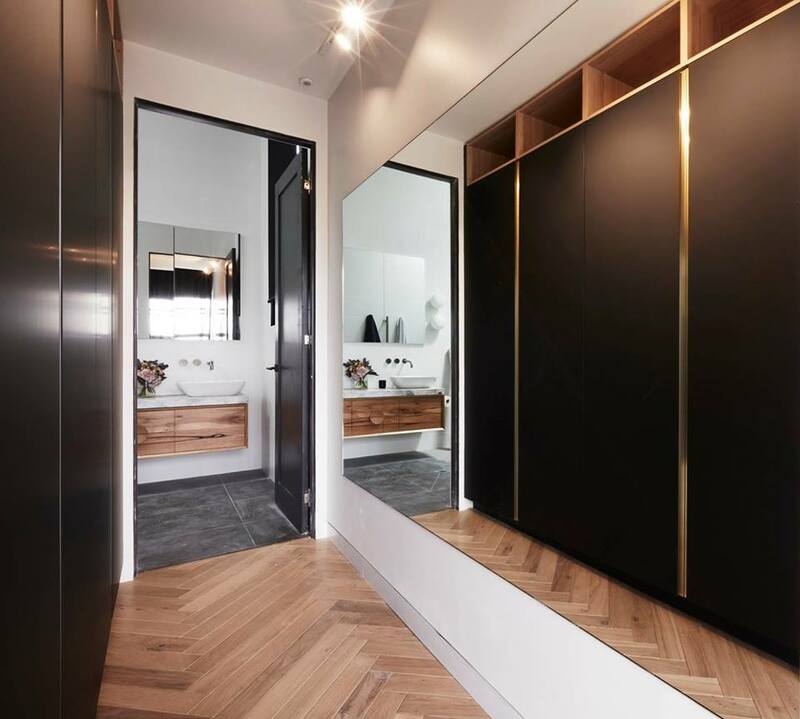 Keeping the dark colours consistent, Kerrie and Spence used “Bottega Oak” as the choice for their wardrobe cabinetry by Kinsman. As a near-black coloured oak with wide, distinct, black oak wood grain features throughout, I can’t see it dating and I fell in love with it. Through to the laundry and again Kerrie and Spence won this room, just one point shy of a perfect 30/30. 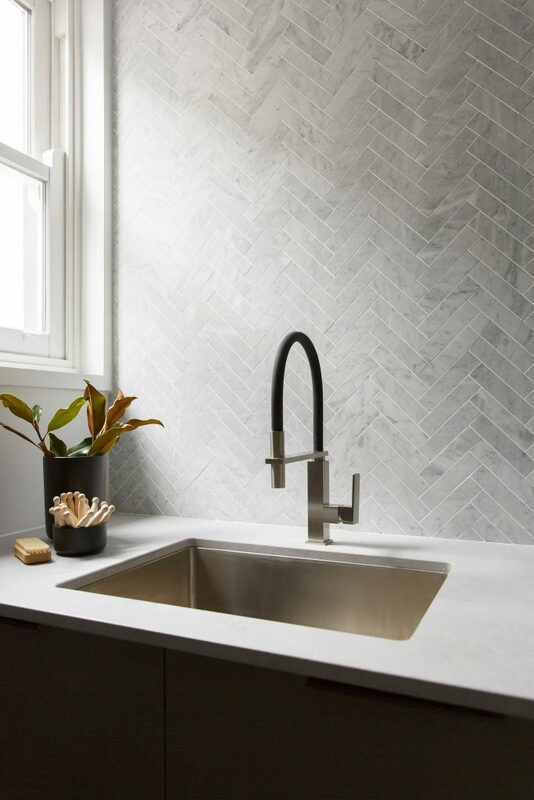 The design was consistent with the kitchen – which was a tick from me – with the use of Burnished Wood and Moose cabinetry, the Caesarstone Airy Concrete benchtop and then something a little different: a gorgeous marble herringbone tiled splashback: STUNNING. Overall, I loved the colours, finishing choices and layouts. Sounds as though it could be my pick? You’ll have to keep reading to find out! I would love to have positive things to say about this kitchen and apartment but it did feel a little odd to me. 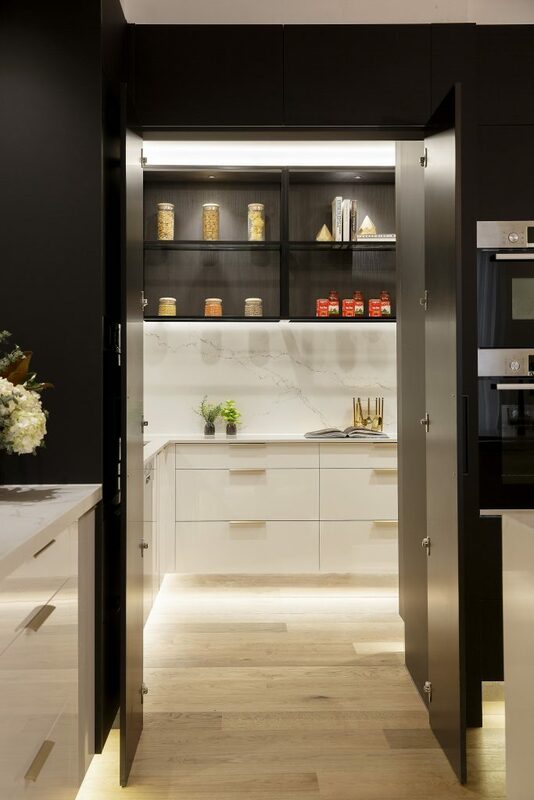 Walking in, the kitchen felt poked into a corner, with – like the judges pointing out – the natural light “hidden” in the butler’s pantry. 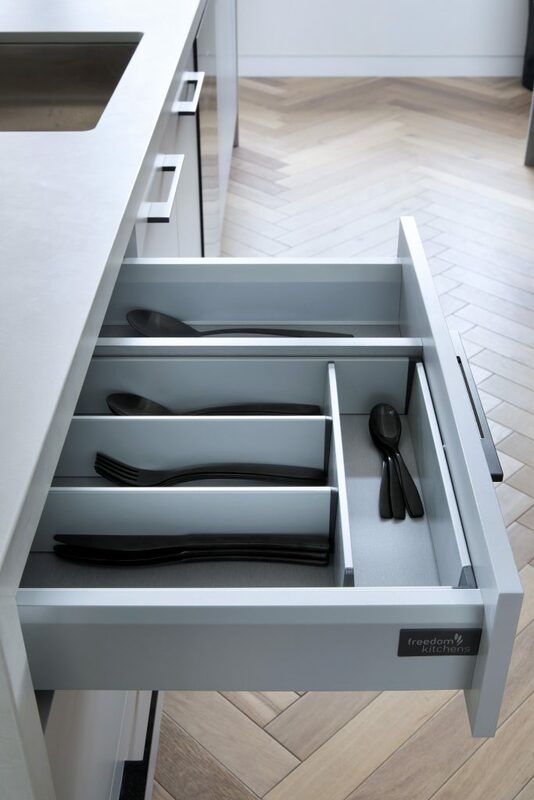 I also didn’t feel drawn to the choice of cabinetry – but I respect the risk taken with the metallic “Champagner”, which I know some people would LOVE. 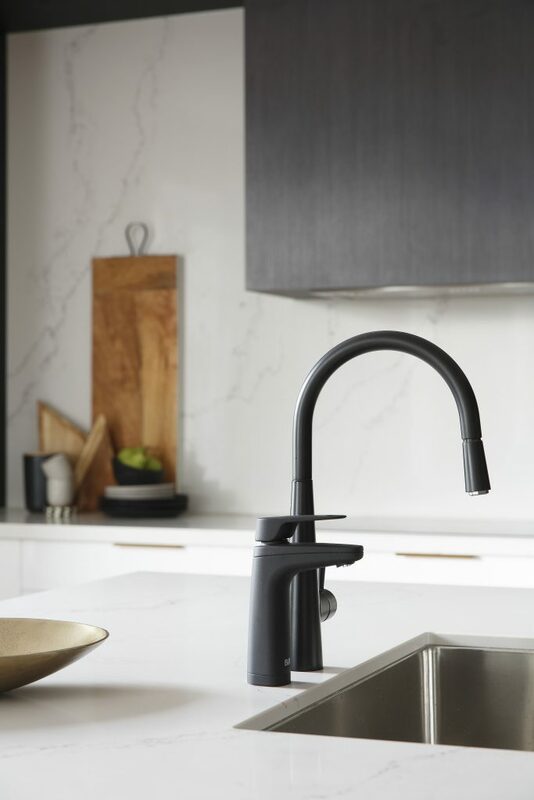 The taps and handles were a combination of silver and black – which felt like a missed opportunity to play on the gold tones of the cabinets. 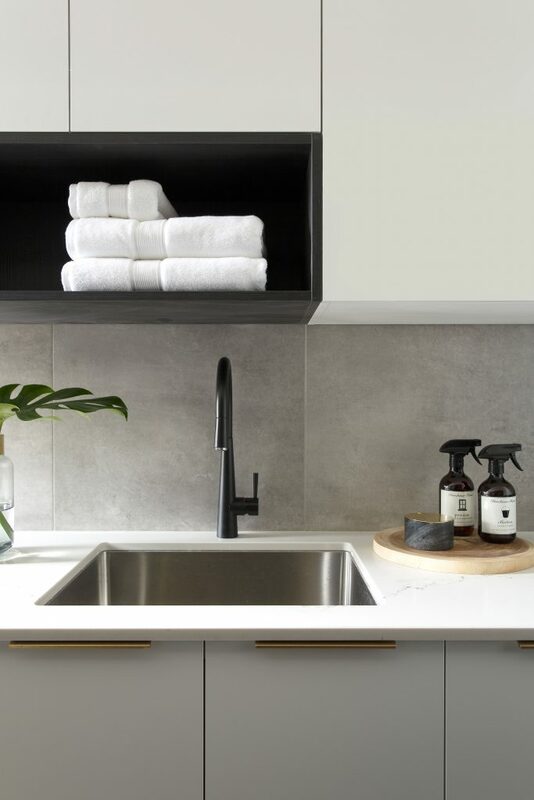 Caesarstone’s White Attica was used throughout, from the island benchtop to the splashbacks. My personal preference (right now at least!) is more of a matt finish. However, I did love the impressive Bosch Series 8 appliances, which included a warming drawer, an in-built coffee machine and a microwave oven. Tick, tick tick! Then of course there’s the big support beam in the middle of the island bench which really impacts the chance to sit around and converse across it. 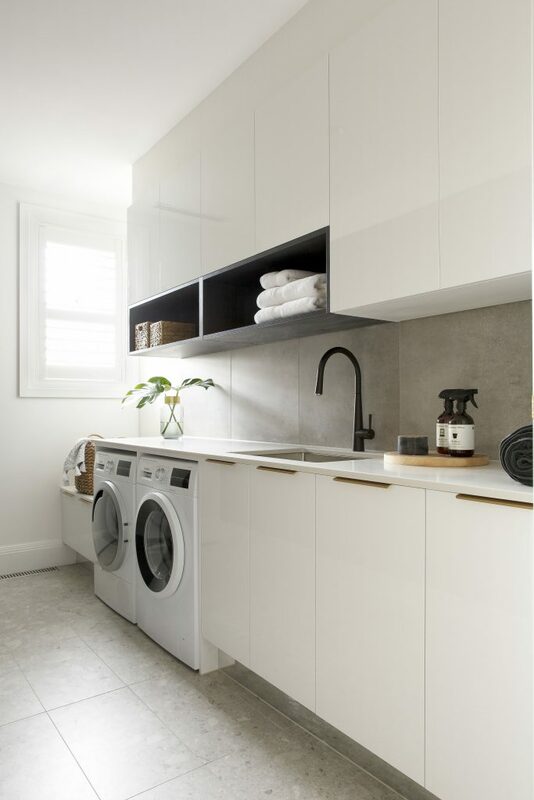 Through to the laundry, and I wasn’t personally a fan of the terrazzo look tiles or the all white cabinetry. It would have been nice to see some consistency from the kitchen through to the bathroom. It felt a little flat and cold. 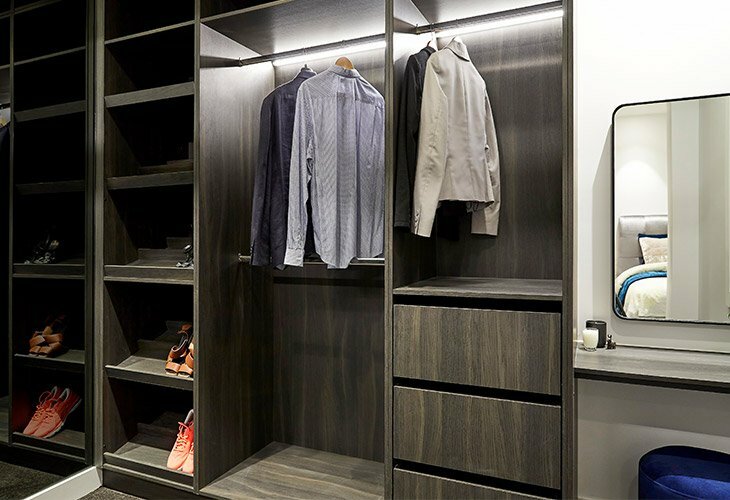 Next – the wardrobes, and the master walk in robe! 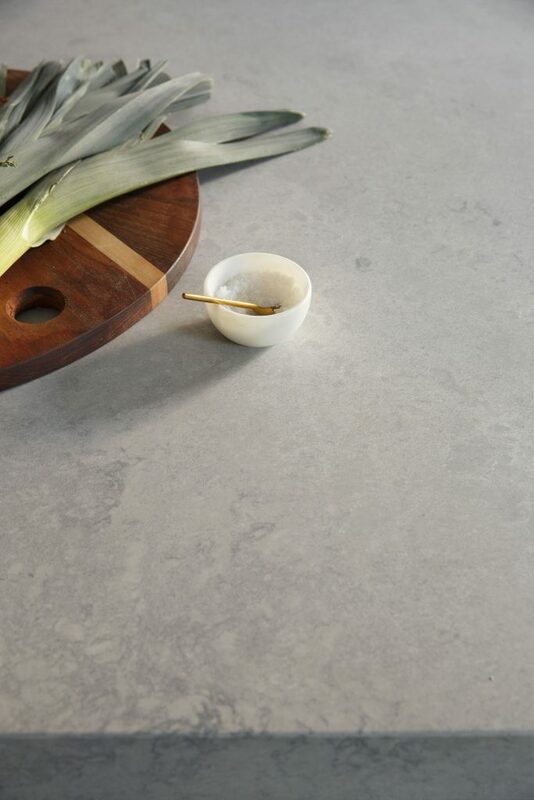 It was fun to see the use of Kinsman’s “Greige Linen”. I couldn’t believe this cabinetry wasn’t actually linen finish. I kept touching it to check! LOADS of room made for a very appealing WIR! I didn’t want to leave this apartment! It also felt really warm and inviting to be in. Hayden and Sara came in second place for their kitchen. I can imagine friends and family gathering in it and making use of the long bench seating under the window. Hayden and Sara flipped the orientation of the kitchen but it worked well in their space. 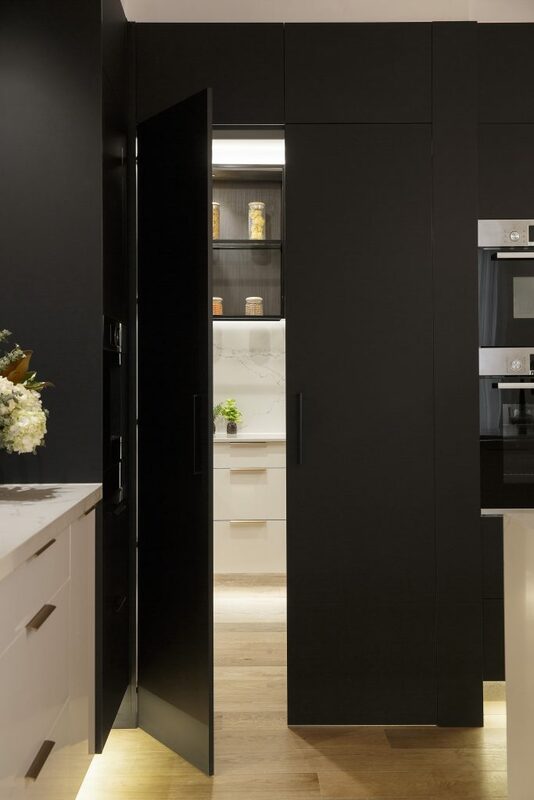 This couple chose “Supa Black” for the majority of their cabinetry which looked fantastic, but I personally preferred the grain detail in the “Burnished Wood” seen in Apartment 1. 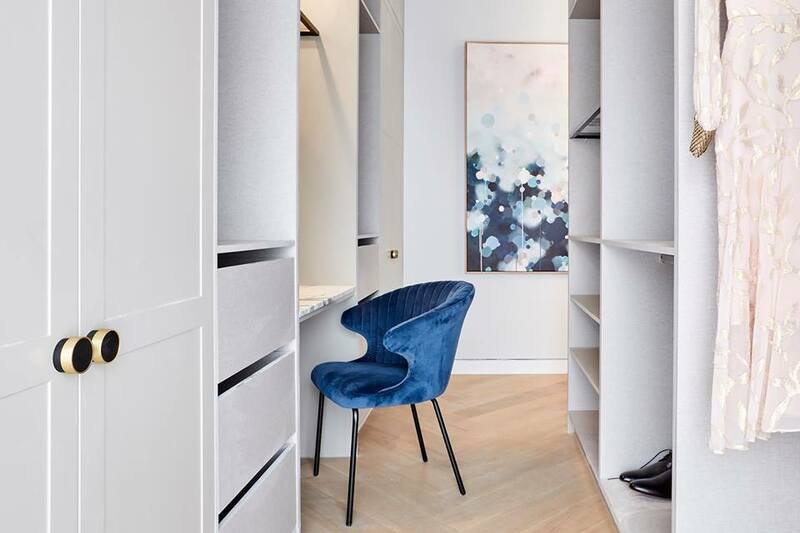 This was contrasted by ‘Alaskan White Gloss’ drawers and Caesarstone’s marble-like ‘Statuario Nuvo’, which was also used for their oversized splashback which extends up to the ceiling. 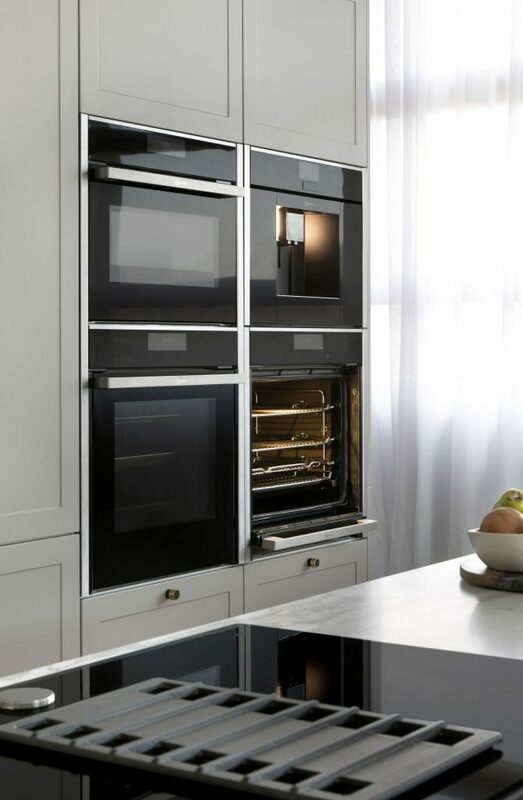 A big selling point of this kitchen are the appliances, with four – yes FOUR – ovens from Bosch’s Series 6 range: two 60cm pyrolytic ovens and two compact microwaves ovens – including one with a steam function. What a fantastic idea. Then of course there’s the Bosch Series 8 built in coffee machine, along with the Series 6 induction cooktop, fully integrated fridges and two dishwashers. Kitchen HEAVEN. Through to their butler’s pantry – it was huge! 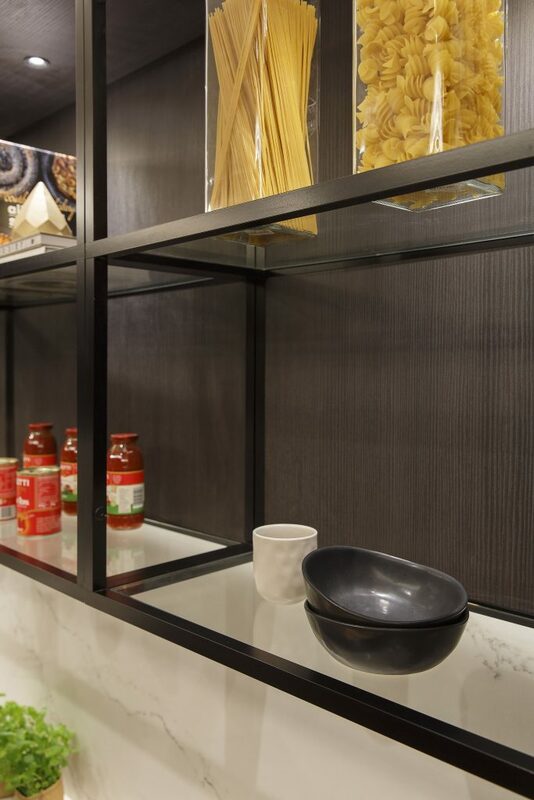 And incorporated Freedom Kitchens’ new ‘2020 Black Alumin’ rack shelving, drawing from one of the latest kitchen design trends from Milan. 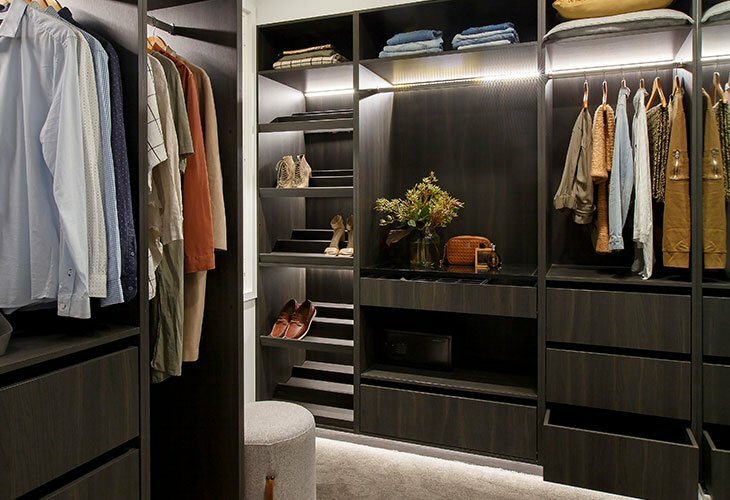 Needless to say I loved their walk in robe – the use of “Bottega Oak” by Kinsman felt luxurious and there was PLENTY of space for shoe-lovers!! 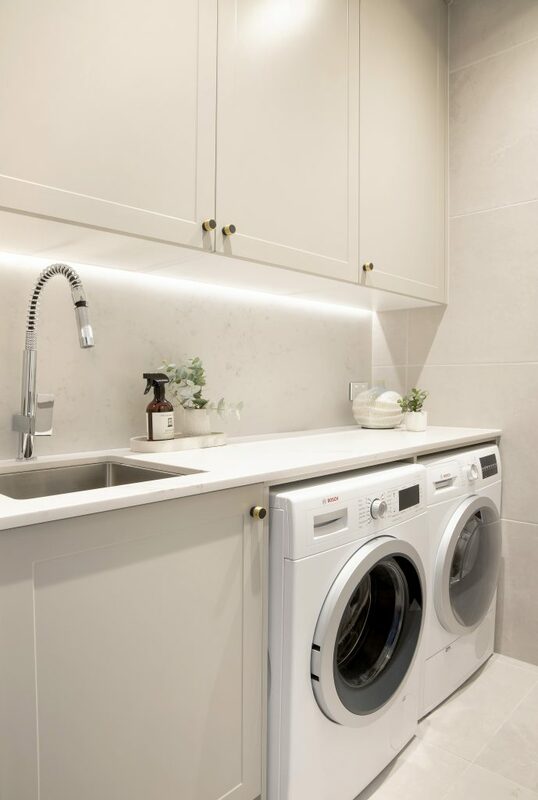 Finally, Hayden and Sara’s laundry was really beautiful: light, spacious and gorgeous combination of cabinetry, tiles and hardware. Next up in our tour was Apartment 4: Norm and Jess’s apartment. The first thing we noticed was the huge four-metre ceilings! A huge difference from the previous apartments. 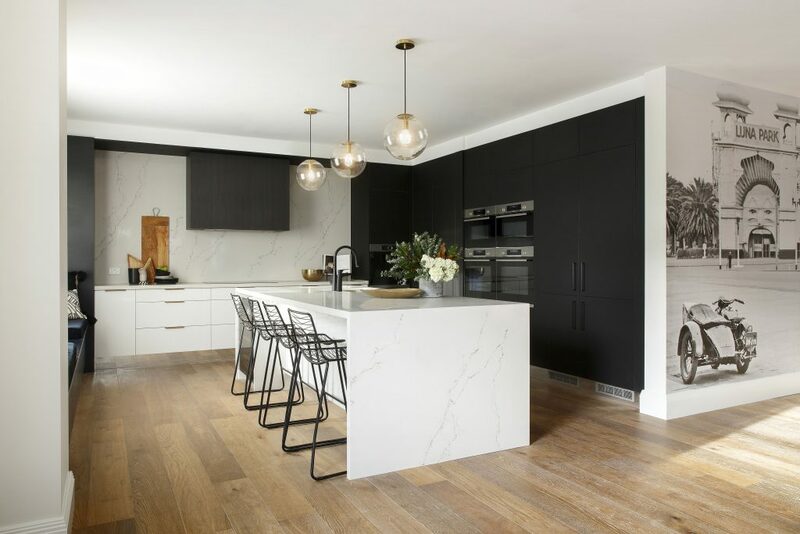 Through to kitchen, which took its design cues from the Hamptons, with Freedom Kitchen’s SIERRA profile doors in the ‘new neutral’ hue of ‘Stone Grey’. 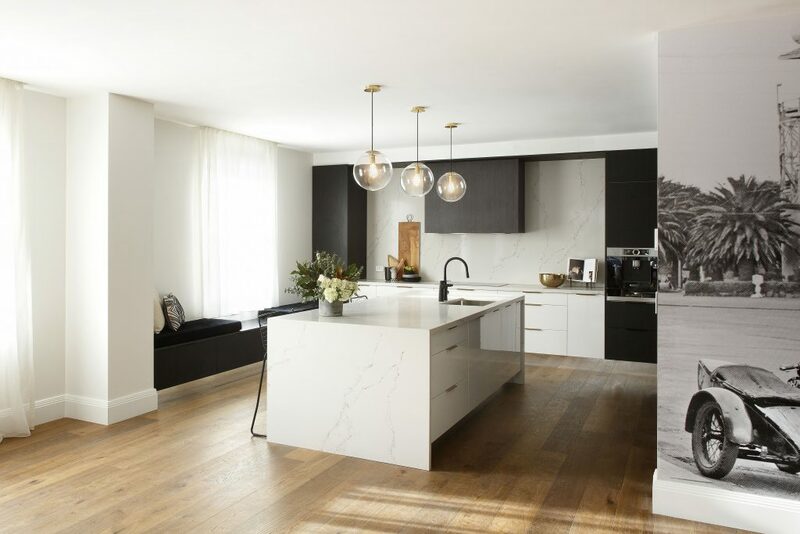 The Shaker-style doors and overall style of the kitchen could alienate some buyers who prefer an uber modern aesthetic – but it felt inviting and glamerous. 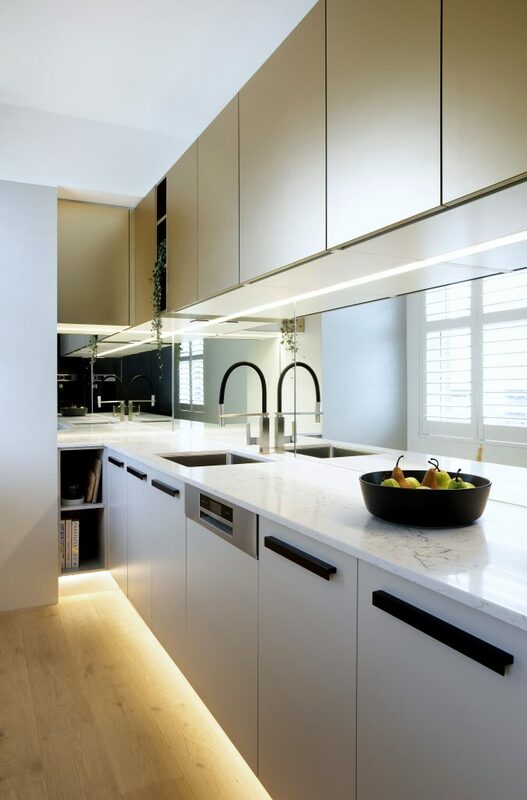 The cabinetry was complemented with marble-look benchtops: Caesarstone’s ‘Statuario Maximus’ with subtle vein patterns. And the size of the island bench is a big drawcard – with the clever induction cooktop with integrated downdraft ventilation cooktop by NEFF. I had never seen on of these below – very innovative! Opposite the island bench are a luxurious four oven NEFF appliance set: 60cm oven with FullSteam, 60cm pyrolytic oven with VarioSteam, pyrolytic compact oven with microwave and VarioSteam, and most importantly a built in coffee machine! 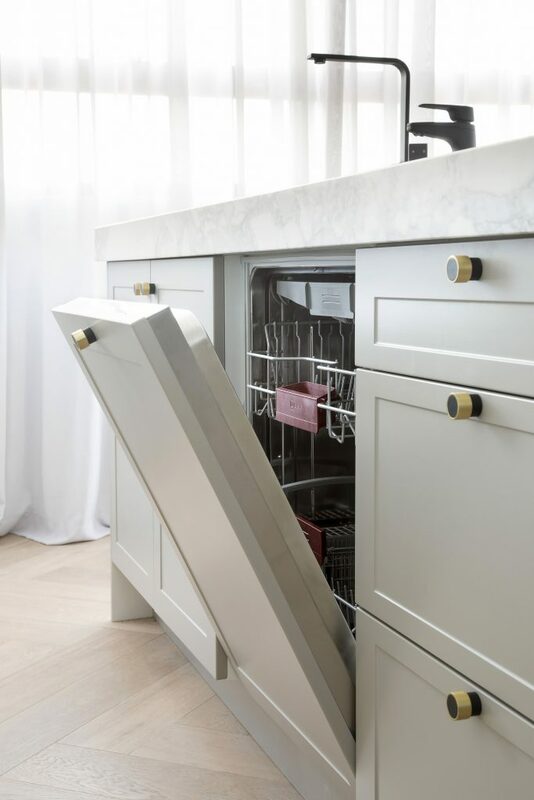 I loved the super clever NEFF “Slide&Hide®” fully retractable doors: a much better way to help us pull hot food from the oven without the risk of burning our arms. 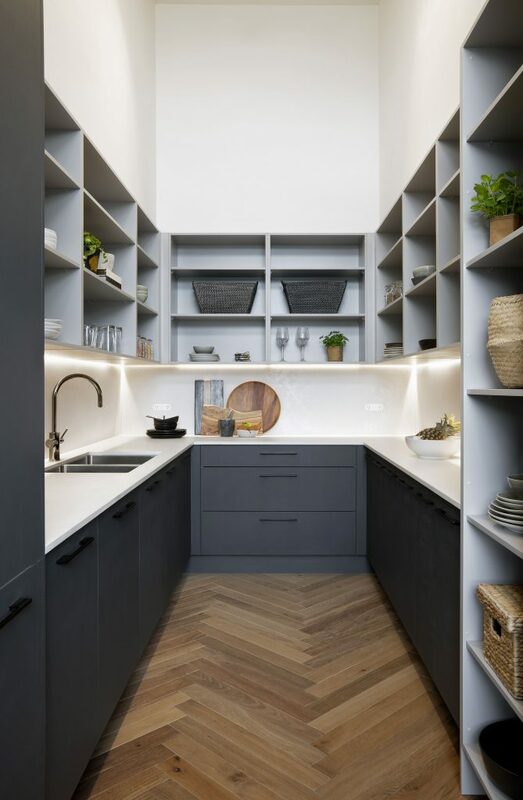 I adored the flooring in this apartment – with the herringbone design mirrored in the butler’s pantry splashback – along with the soft floor to ceiling drapes. Gorgeous! 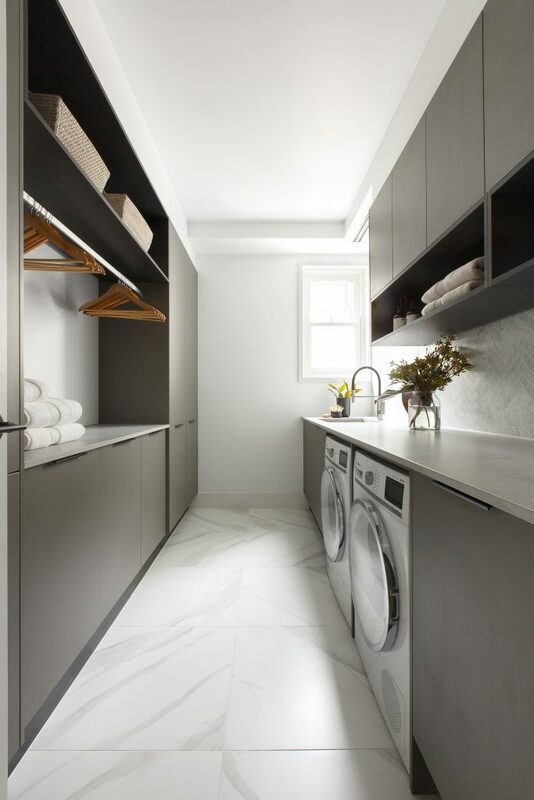 The laundry was consistent with the kitchen finishes and the glamerous walk in robe saw the same Stone Grey Somersby Shaker doors as the kitchen, along with Kinsman’s “Greige Linen” for the interior finishes, and those incredible statement handles and herringbone floor. Apartment 5: Bianca and Carla. 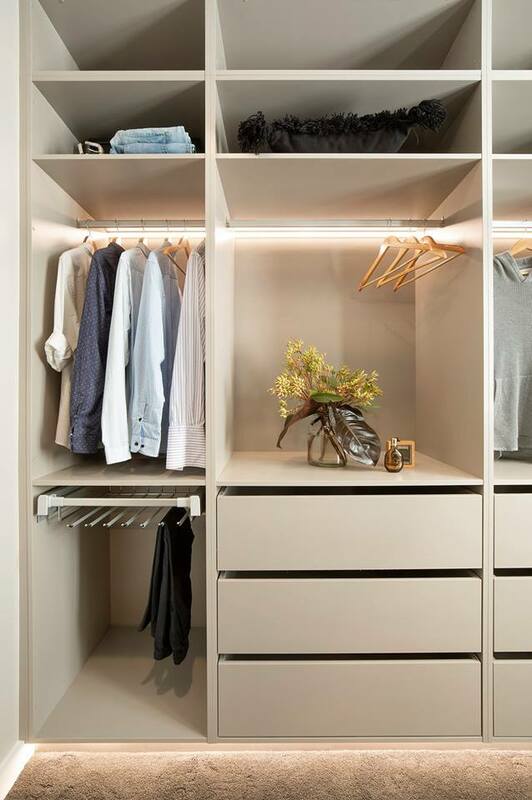 This apartment gave me the biggest “wow” factor on entry. It was AMAZING – those ceilings were incredible and feel even more impressive than in Norm and Jess’s apartment. To me, the kitchen, dining, living felt resort style with gorgeous fans, floaty drapes, endless windows and global-inspired decor. 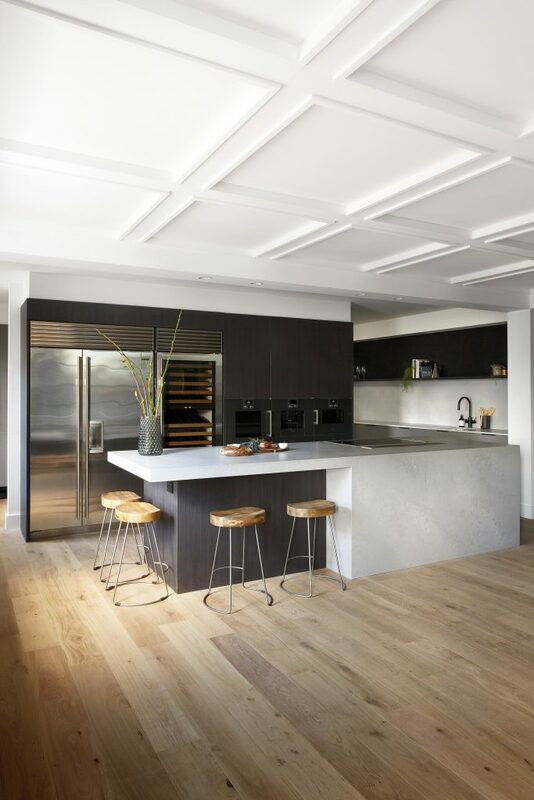 This couple’s kitchen was generous in proportions and featured huge amounts of storage. 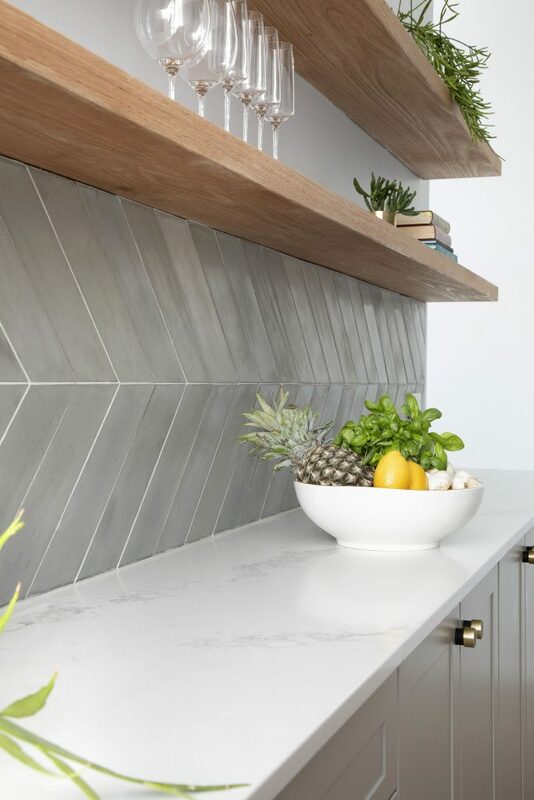 Caesarstone’s ‘Cloudburst Concrete’ was a lovely choice for the benches, while Freedom Kitchen’s (NEW) ‘Fox Grey’ and ‘Charcoal Riven’ created a wall of streamlined storage. This was an interesting choice with two tones of cabinets and one I felt I would prefer in just the single colour. Adding to the luxury of this kitchen are the Siemens appliances, with the new iQ700 studioLine range taking pride of place. This includes the combination of a full size pyrolytic oven with microwave and pulseSteam, a compact oven with fullSteam, a warming drawer, a vacuum drawer (ideal for sous-vide cooking! ), importantly – an in built coffee machine and the sleek induction cooktop with downdraft ventilation. Phew – what a set! Through to the laundry, which felt high end with its premium timber laminate bench and tiled splashback. 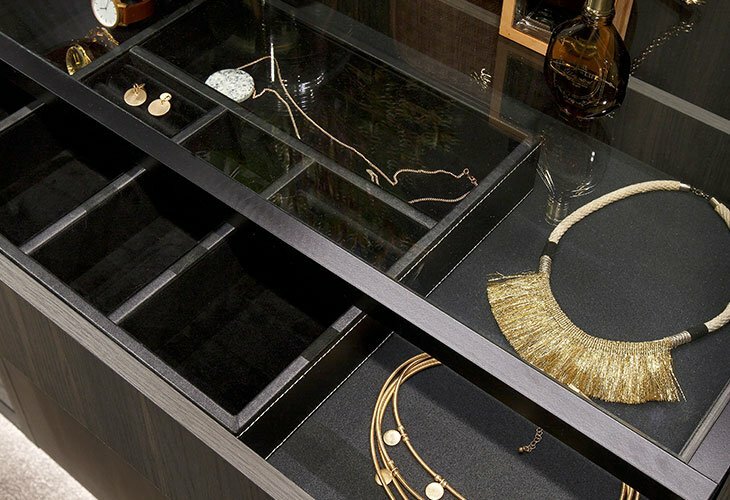 Then of course were the wardrobes where I loved the touch of gold – officially, according to Kinsman called the “peak handles in brushed gold”! So – which was my pick? I have a couple! I think the apartment that will sell for the highest price would have to be Bianca and Carla’s. Those huge ceiling heights and they way they have heroed them in their apartment feel a million dollars (or several!). 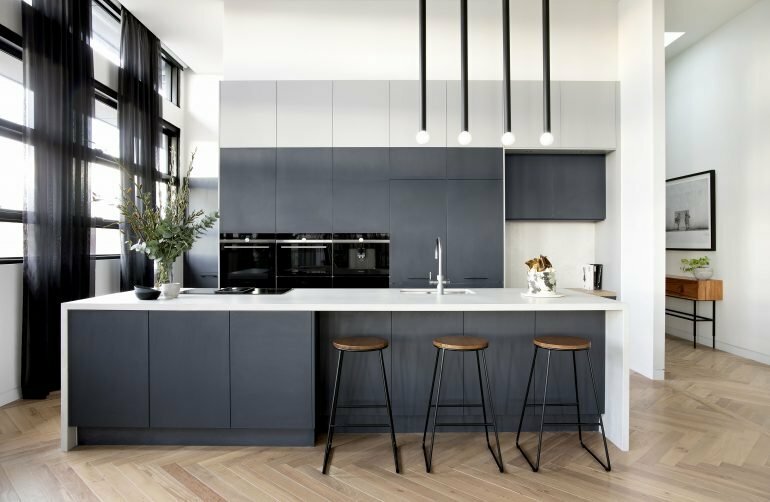 When it comes to my favourite kitchen, my pick is Kerrie and Spence – I loved their choices in cabinetry, benchtops – all of it! 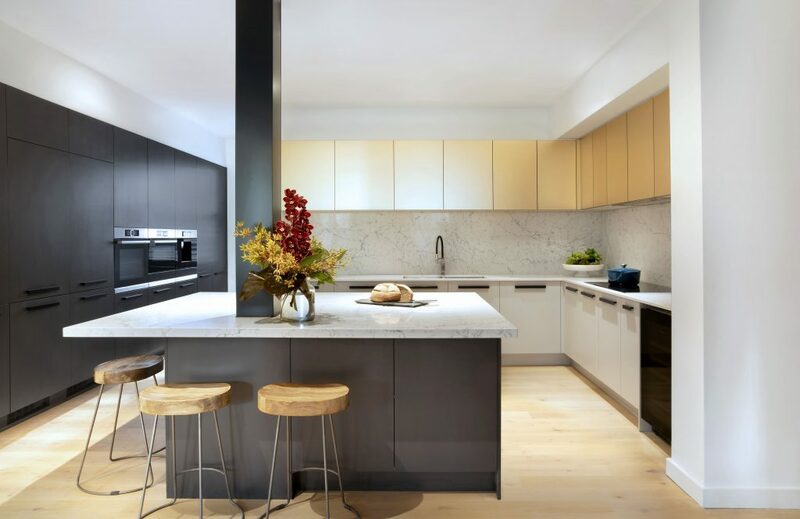 I also loved the feel of Hayden and Sara’s – and while I didn’t love all the choices, the orientation of the space worked really well and the rest of the kitchen dining space came together beautifully. 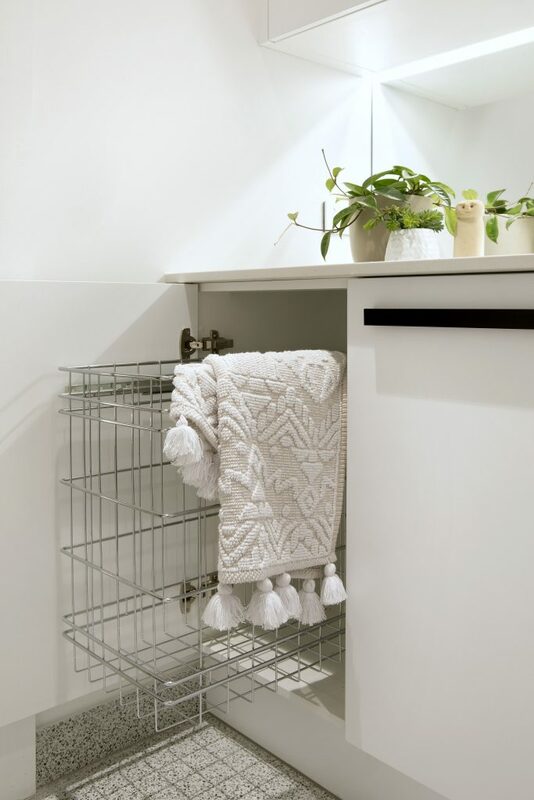 So there you have it – my wrap of The Block 2018’s kitchens, laundries and wardrobes! 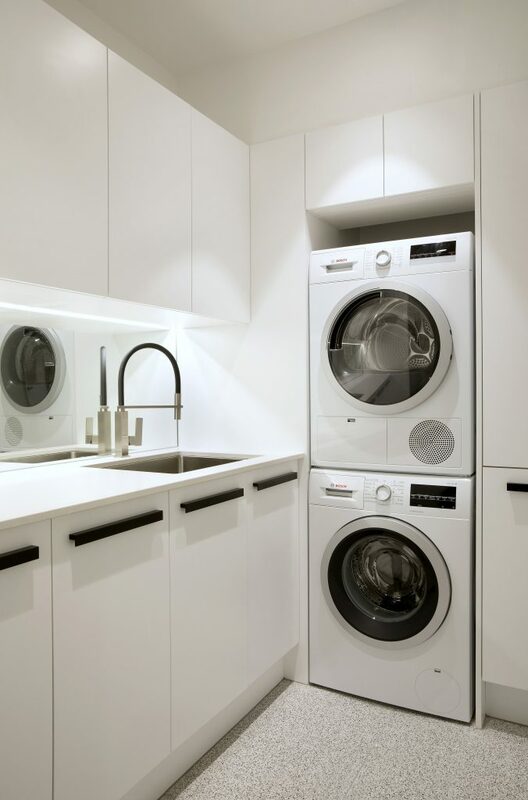 I want to know – which apartment is YOUR favourite based on the kitchens, laundries and wardrobes? Let me know below!